Rosamond, CA – March 17, 2017 – The first round of the 2017 Trans Am West Championship presented by Pirelli is scheduled to kick off at Willow Springs on March 26. This inaugural event at the historic southern California road course will feature an exciting weekend of Trans Am racing and vintage SVRA cars – a timeless mix of nostalgia and modern motor racing. 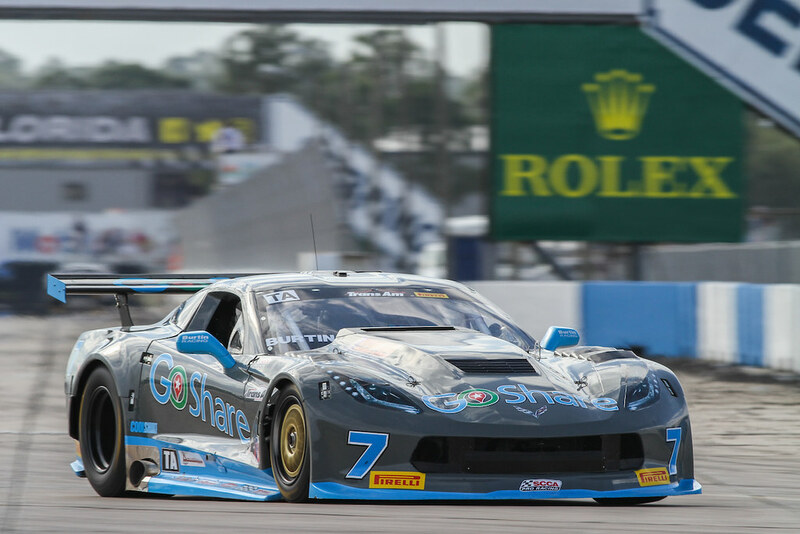 Burtin Racing and GoShare announced that they will be filling the Chevrolet Corvette seat with a series rookie, Adam Carolla. Partner GoShare will be featured as the primary sponsor of the No. 33 GoShare Corvette. The Willow Springs event will mark Carolla’s first professional start in a pro-sanctioned race event. But Carolla has been carefully honing his racing craft alongside a busy work schedule in recent years. Most notably, he dominated while competing in the Grand Prix of Long Beach Toyota Celebrity race by winning the class in 2012 and returned the following year to win again in 2013 — in the pro category. Carolla is also noted for many appearances racing historic cars at Laguna Seca, Auto Club Speedway and Sonoma Raceway, and he has a career-best finish of third place at the Rolex Historics at Monterey. It will be a race of many firsts. The inaugural Trans Am West Series race at the famed Willow Springs venue should be one to follow. The “fastest track in the west” opened in 1953 and played host to the first two NASCAR races west of the Mississippi. The iconic circuit has also been a staple in Hollywood film and commercial settings. The 1969 Disney hit movie “The Love Bug” featured the track as “Jackrabbit Springs”. Unique amongst its North American peers, Willow Springs International Raceway’s Big Willow circuit has seen no alterations whatsoever to its original layout in over 60 years of motorsport operations. The course is shaped along a gentle gradient with a stunning mountain backdrop, covers 2.5-miles and consists of nine challenging corners– all requiring commitment and rhythm from drivers. Willow is regarded by many top professional drivers as one of the all-time classic North American circuits. Official qualifications for the 2017 Trans Am West Championship presented by Pirelli will take place Sunday, March 26 at 10am PT with the 100-mile race scheduled to start at 3pm PT. Stay connected from your mobile device on the Race Monitor app.